With the use of any electrical appliance, it is important to observe all basic precautions to minimize the risk associated with use, such as electrical shock, fire, or injury to persons. 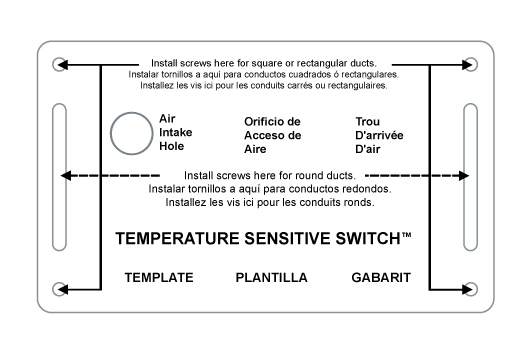 Read these instructions before using your DuctStat® Temperature Sensitive Switch™. If you have doubts or are unfamiliar with this type of installation work, seek the services of a qualified electrician. Suncourt Inc. assumes no responsibility for installation of the DuctStat®. For your safety and protection, follow all instructions and adhere to applicable building and/or electrical codes. This unit is equipped with a three prong grounded plug. DO NOT attempt to defeat this feature of this plug. Defeating this will void the warranty. Do not use in an attic or crawlspace. DANGER! High voltage inside unit. DO NOT OPEN. In order to prevent excessive stress on the mounting screws, support the DuctStat® when unplugging connected devices. Do NOT use the DuctStat® outdoors or in damp locations. The DuctStat® must remain accessible. The DuctStat® is intended to control the automatic On/Off operation of In-Line Duct Fans™ installed in the ductwork of forced air distribution systems. The DuctStat® can also control the line voltage to any electrical device with a maximum current draw of 5 Amperes. The DuctStat® is equipped with an external, replaceable 5 AMP fuse to protect the electronic circuitry from overload or short circuits. This device is designed to turn on and off from temperature rise and fall. If you want the DuctStat® to turn a device on when the temperature rises above your set point you put it on “ ”. If you want the DuctStat® to turn a device on when the temperature drops below your set point you put it on “ ”. The DuctStat® will deactivate when the temperature returns to your set point. If you have questions or comments, please call us at 1-800-999-3267 or send an email to info@suncourt.com. 1. Locate the position between the In-Line Duct Fan™ and the register where you wish to mount the DuctStat®. Mount between 1 and 10 feet downstream from the In-Line Duct Fan™. 2. Tape the template supplied with the DuctStat® to the air duct to mark the mounting holes to be drilled. 3. Drill a hole in the air duct for the Air Intake Hole shown on the template. This hole should be 1/2" in diameter. 4. Drill holes in the air duct to line up with the appropriate holes located on the template. On round ducts, two screws placed through the slots in the DuctStat®’s base will be adequate (placement shown on template). On square or rectangular ducts use four screws, one at each corner of the DuctStat® (placement shown on template). 6. Plug the device into the outlet on the face of the DuctStat®. 7. Plug the DuctStat® power cord into a 120 VAC grounded household outlet. 8. Follow Operation Settings to adjust the DuctStat®. When switch is on “ ” the DuctStat® will turn ON as the temperature rises. 1. Perform Operation Settings in the environment in which the DuctStat® is being used. For use with forced air systems, make sure the blower is not running. 2. Plug in the DuctStat® and set the switch to “ ”. 3. Set the Differential to 3°. 4. Plug the device you want to control into the DuctStat®. 5. Turn the knob clockwise until it stops. DO NOT FORCE. 6. Move the switch to “ ”. You should see/hear the device that is plugged into the DuctStat® turn on. 7. Move the switch to “ ”. At this point the device plugged into the DuctStat® will turn off. 8. Slowly turn the knob counterclockwise, just until the device plugged into the DuctStat® turns ON. 9. Slowly turn the knob clockwise, just until the device plugged into the DuctStat® turns OFF. 10. The DuctStat® is now set to turn on when the temperature rises. If you would like the DuctStat® to have a wider range, simply switch the Differential to 7°. This will turn the device on and off with a larger on/off differential. When the switch is on “ ” the DuctStat® will turn ON as it senses cooler air (temperature drop). 5. Turn the knob counterclockwise until it stops. DO NOT FORCE. 8. Slowly turn the knob clockwise, until the device plugged into the DuctStat® turns ON. 9. Slowly turn the knob counterclockwise, until the device plugged into the DuctStat® turns OFF. 10. The DuctStat® is now set to turn on when the temperature drops. If you would like the DuctStat® to have a wider range, simply switch the Differential to 7°. This will turn the device on and off with a larger on/off differential. To shorten the length of time that your device continues to run after the warming or cooling air has shut off, rotate the knob control slightly further, as in Step 9. Should you experience frequent On/Off cycling, move the Differential switch to the 7° position. THIS TEMPLATE IS NOT TO SCALE. PRINTABLE TEMPLATE IS AVAILABLE WITH PRODUCT DATA SHEET AT THE TOP OF THIS PAGE. 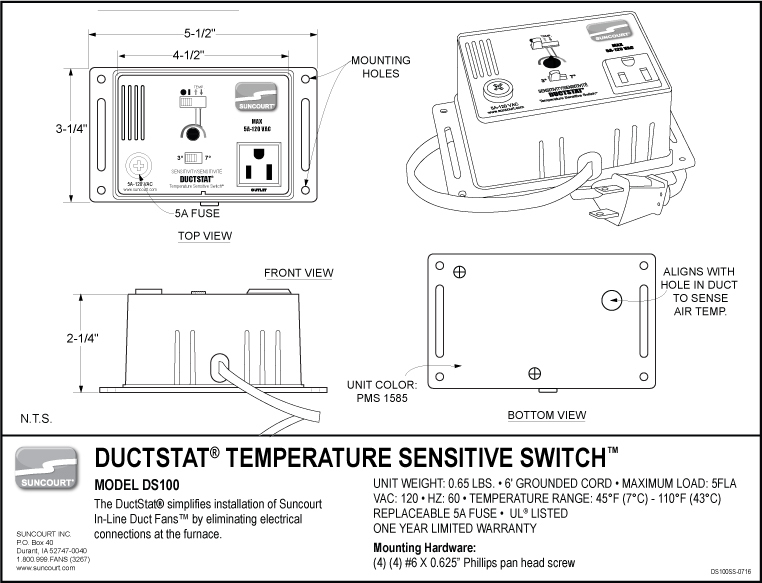 Subject to the following limitations, Suncourt® Inc. (manufacturer) warrants that the DuctStat® Temperature Sensitive Switch™ will, for 1 (one) year from date of original retail purchase, but not exceeding 2 (two) years from date of manufacture, remain free from appearance of defects in workmanship or materials. This warranty is subject to the following limitations: (a) manufacturer’s liability is limited to the replacement or repair of the DuctStat®, as decided by the manufacturer; (b) a defective DuctStat® must be returned, prepaid, with proof of purchase, well packaged to avoid damage in transit; and (c) this warranty does not apply to defects resulting from the alteration, abuse, accidental damage, unauthorized repair, or misuse of the DuctStat®. This warranty is given in lieu of all other warranties, guarantees, and conditions on manufacturer’s part, and the manufacturer shall have no tortious or other liability in respect to this DuctStat® Temperature Sensitive Switch™. Ship unit to Suncourt Inc. only after obtaining a Return Goods Authorization (RGA) number. Returns without this RGA number will not be accepted. Suncourt reserves the right to modify any or all of its products features, designs, components and specifications without notice. The Suncourt® DuctStat® also known as a Plug In Thermostat, Inline Thermostat, or a Plug In Temperature Sensitive Switch is an economical way to turn a 110 volt device on or off due to temperature rise or fall from a user predetermined set point. The DuctStat® is adjustable between 45 degrees F (7 C) to 110 degrees F (43 C). What would I use a Suncourt® DuctStat® for? Suncourt Inline Fans-Use a DuctStat® to turn an Inline Fan on or off that is installed in the ductwork. This keeps you from having to run potentially long wires back to a fan motor in your furnace and reading its wiring diagram to correctly connect the wires. Lights-The DuctStat® can be used to turn on a light bulb or heat lamp when the temperature falls below your set point in a hot box or other contained space that you want to keep above a certain minimum temperature. Hydroponics- Indoor gardeners use the DuctStat® to turn on fans to help cool hot grow lights. Ventilation-The DuctStat® can activate a wide variety of fans if temperature in a room or space rises above a user-determined maximum. How does the Suncourt® DuctStat® work? The DuctStat® contains a thermistor, which is a very sensitive temperature-sensing device. When the thermistor detects a change in temperature from your set point the DuctStat® activates. The min/max switch on its face controls the maximum differential between on and off. Max stands for maximum differential of about 7 degrees F. Min stands for minimum differential of about 3 degrees F. Simply plug-in your 110 volt device to the DuctStat’s grounded outlet and begin the setting procedure described in the included instructions. If you want the DuctStat® to turn a device on when the temperature rises above your set point you put it on the heat setting. If you want the DuctStat® to turn a device on when the temperature falls below your set point you will want to put it on its cool setting. The DuctStat® will deactivate when the temperature returns to your predetermined set point. Please see the operating instructions for more detail on setting the DuctStat®. What will a DuctStat® do for me? The DuctStat® Line Voltage Thermostat greatly simplifies the installation of the power supply to any of our Inductor® In-Line Duct Booster Fans. When you install an Inductor®, it often happens to be in a location far from your furnace system. Air has a long run to those areas and loses much of its volume and heat (cool in the summer) along the way. This also means that the wire you must run has to go a long distance. Perhaps you have a dry-walled ceiling in your basement, making it difficult if not impossible to run a wire from the Inductor to the furnace for operating power. No matter what reason, the DuctStat® allows you to control the automatic ON/OFF function of your Inductor locally, both for winter heating and summer cooling. Where do I install the DuctStat®? The preferred location of the DuctStat® is just ahead (downstream) from the Inductor fan but not closer than 8 inches. Otherwise, anywhere on a duct where it can sense heated or cooled air. How do I install the DuctStat®? The DuctStat® is an electronic temperature sensitive line voltage thermostat, meaning it switches a 110-120 Volt AC outlet on the front panel ON and OFF depending on the user preset temperature. It mounts on the duct in which your Inductor® is installed with 2 or 4 sheet metal screws. You will make a small ½" hole in the metal duct before installing the DuctStat®. The DuctStat® has a corresponding hole in the back of the housing. This allows a small amount of air to flow through the DuctStat® over the temperature-sensing element, thus sensing if your furnace is running (heated air) or if your air conditioner is running (cooled air). Can I build a DuctStat® into a wall, i.e. drywall or panel over it? No. The DuctStat® must remain accessible. You will have to switch the function switch to HEAT for the winter and COOL for the summer. You may also need access for service, cleaning or to replace the front panel fuse. Can I use it to control other stuff depending on temperature? Yes. Simply mounted on a wall, the DuctStat® will sense ambient temperature and turn device ON or Off at a user selected temperature. You may control any device with a 5 Amp maximum load such as: a warning siren or light, electric operated vent louver, the Suncourt ThruWall Fan, solar panel fans, greenhouse louvers or fans, etc. How many Inductor fans can I control with the DuctStat®? The maximum load is 5 Amp. Simply add up the Amp rating and do not exceed 5 Amp. Can I switch loads greater than 5 Amp? No. However, you can switch a large relay ON and OFF with the DuctStat®. Your maximum load is now determined by the current capacity of that relay. How do I get 110-120 Volt AC power to the DuctStat®? The DuctStat® has a 6 foot long power cord with a grounded plug. Simply plug it into the nearest outlet. If you do not have an electric outlet within 6 feet, you will have to install one. How do I connect the Inductor® to the DuctStat®? You will have to install a cord and grounded plug assembly on the Inductor. That plug will simply plug into the outlet on the front of the DuctStat®. What is the temperature adjustment range of the DuctStat®? The user selectable temperature range (ON/OFF switching range) of the DuctStat® is approximately 40°F (4°C) to 110°F (43°C). How sensitive is the DuctStat®? The electronic circuitry is very sensitive. The sensing element will react to changing temperatures in a few seconds. The differential between ON and OFF can be selected by the user to be 3°F and 7°F with a Min-Max switch on the control panel. 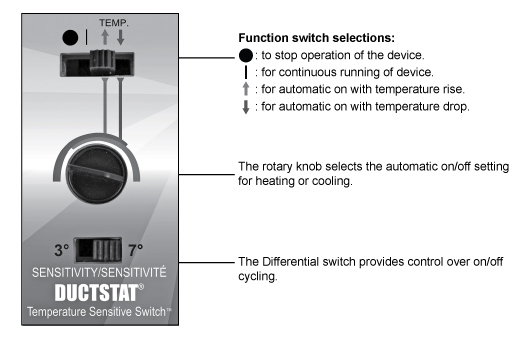 The higher 7°F differential setting is provided to reduce possible ON/OFF cycling of the thermostat when temperature increases or decreases are not smooth. How safe is the DuctStat®? The DuctStat® has been rigorously tested to the standards of Underwriters Laboratories Inc. (UL®). The housing is made of a high strength ABS - Polycarbonate, flame retardant alloy. The electronics and panel outlet are fused by a replaceable 5 Amp panel fuse. Internally, the unit has two additional levels of fuse protection. Both the power cord and panel outlet are 3-prong grounded. How much power does the DuctStat® use? The standby power consumption of the DuctStat® is minimal. Less than 2 Watts.